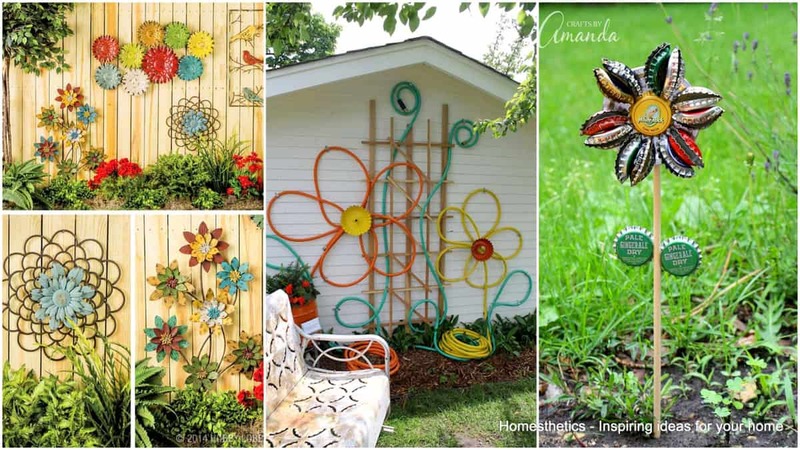 Simple Low Budget DIY Garden Art Flower Yard Projects To Do | Homesthetics - Inspiring ideas for your home. The garden is a place in which we find refugee at the end of a long day, we soothe our nerves, we find peace nestled between greenery; as the snow slowly starts to melt and the gardening activities start to occupy our minds we too start searching diy projects that can change our garden for the better. 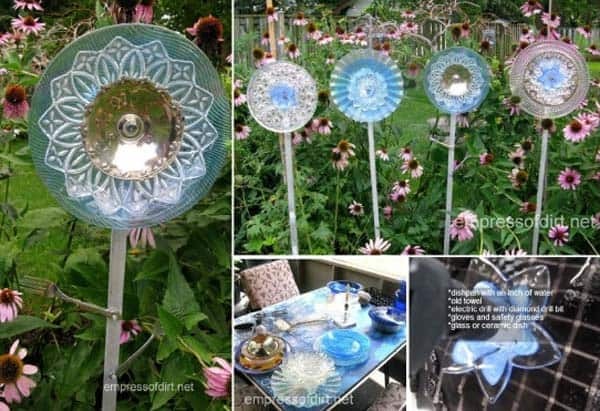 A selection of crafts that beautifully recycles items into cheap diy garden art flower yard projects has been curated to creatively showcase the immense possibilities brought forward by recycling and up-cycling. 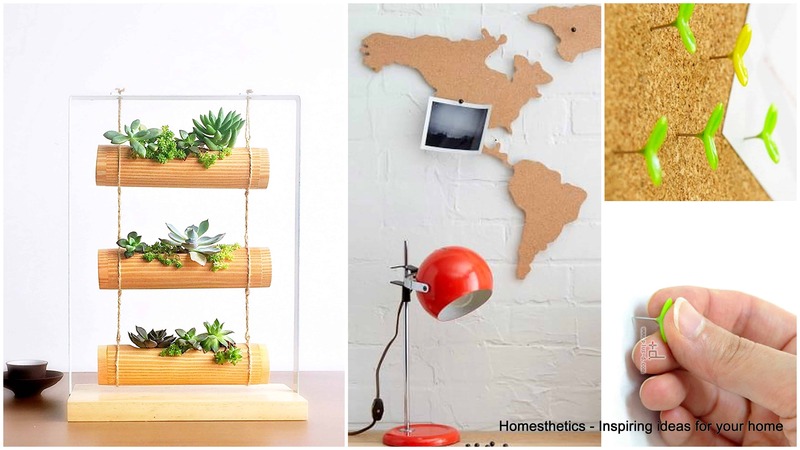 Any item that we discard can be recycled and the vast majority can be up-cycled as well, you can repurpose them creatively thus saving a great amount of energy from hitting the landfill. Cast a glance below and surge inspiration. One could use old plates in a painting session with friends and family only to proudly prepare them for an artistic installation. 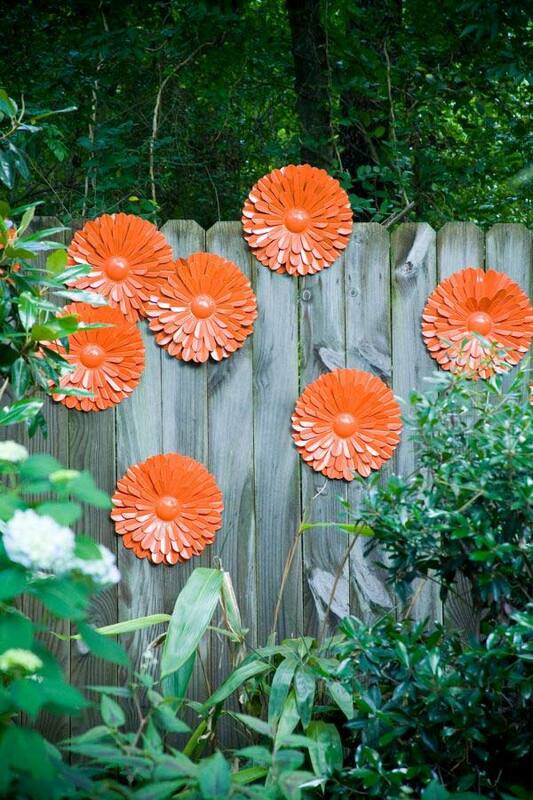 The plates ought to become flowers in a beautiful recycled field of color on your fence, shed or garage. 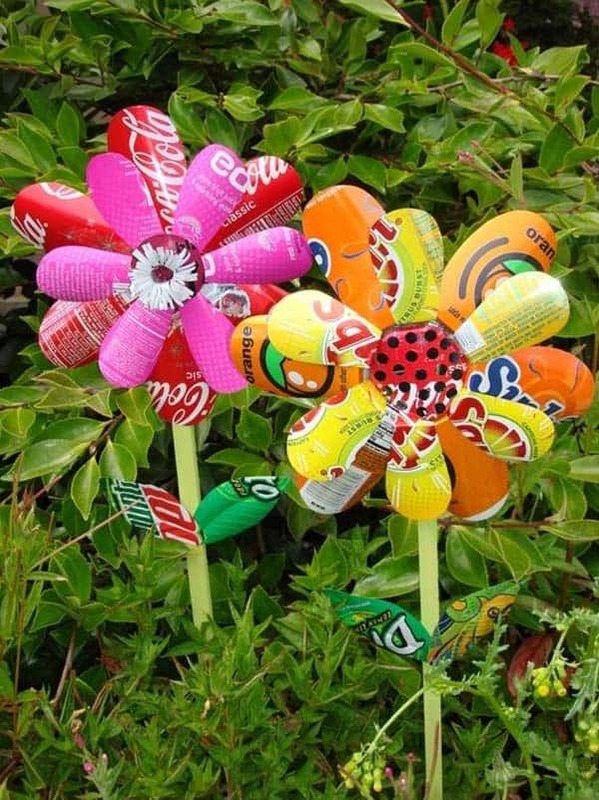 The craft can become a really educative group lesson for children on recycling and up-cycling. 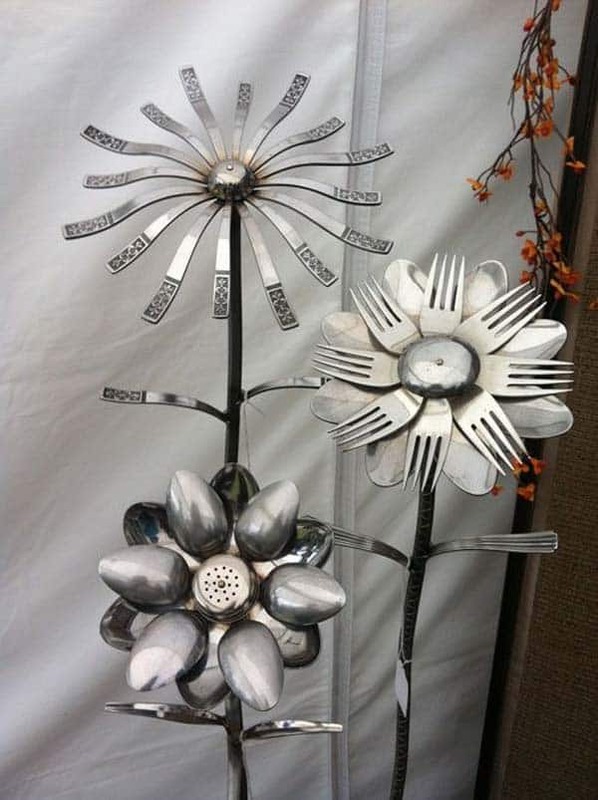 The individual able to work with metal could use old kitchen utensils to shape graphic flowers; the possibilities are limitless as any piece can change the dynamic of the composition greatly. 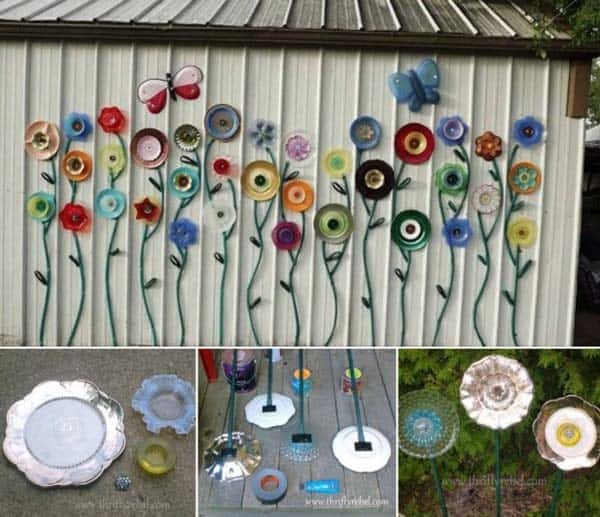 Tin cans can be opened up and creatively painted to create beautiful flower compositions; they can become great planters too in no less than 30 seconds. 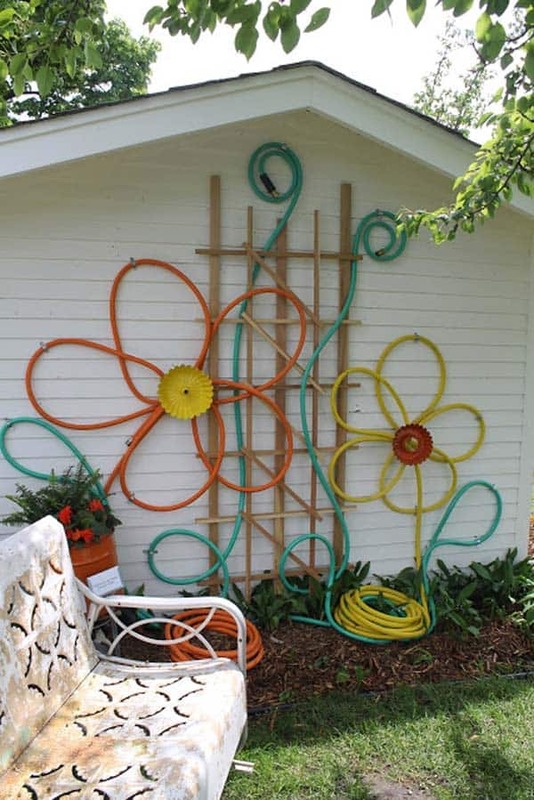 The garden hoses are now inactive and it will be a time till your first crop will need heavy watering but for the time being one could get creative and arrange the hoses into flower installations that foretell the coming of spring. 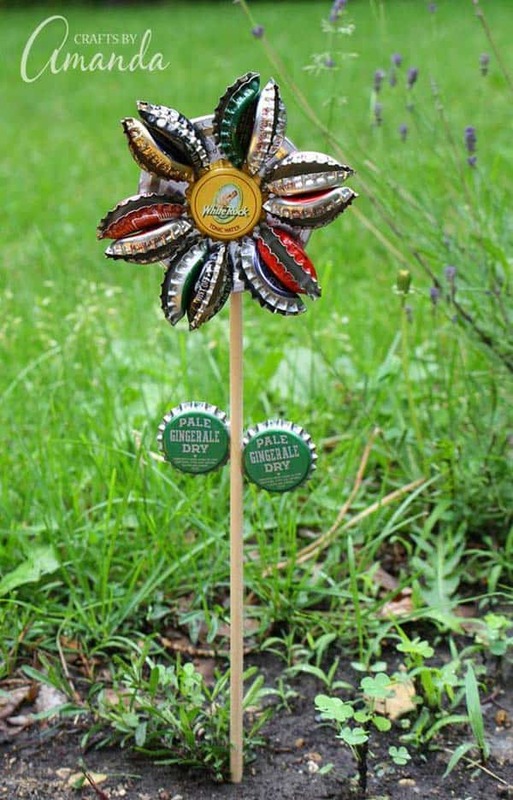 Use simple bottle caps to create simple garden art with the little ones. 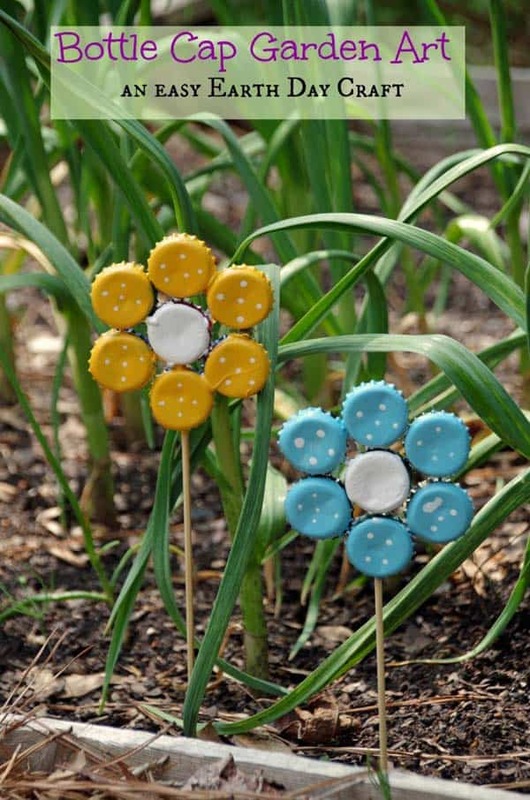 A glue gun, paint, and bamboo skewers are all you might need to get these crafts ready for a colorful spring. 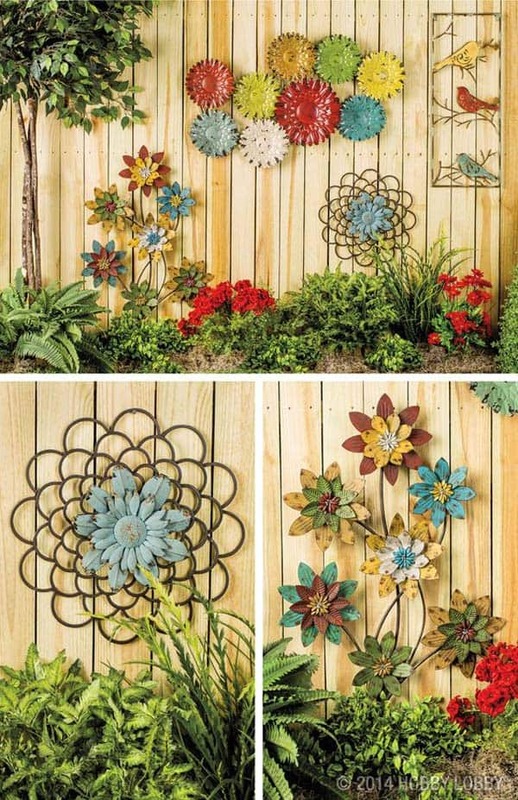 Following the same concept above the flowers here will require your pliers rather than your paint. 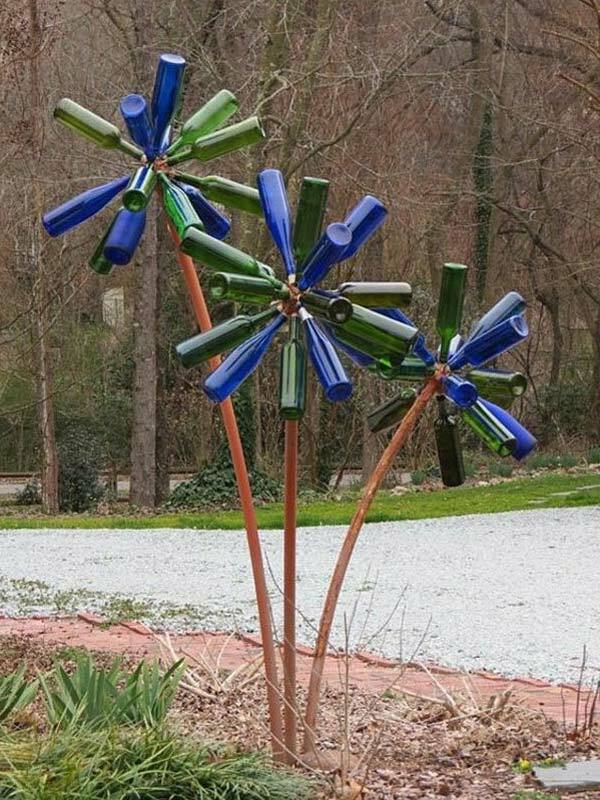 Recycling glass items into complex flower installation requires the enthusiast in you but the results can be quite impressive; always take all the safety precautions when working with glass. 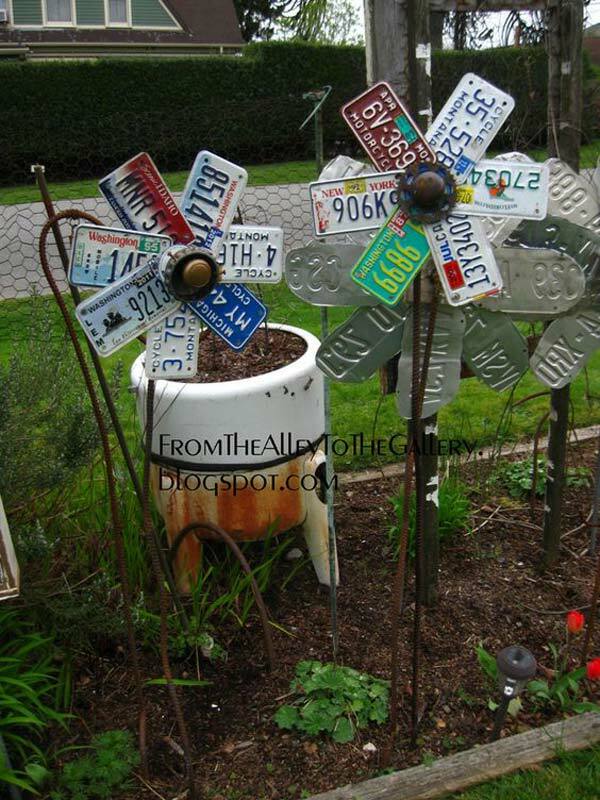 A collection of number plates can bring great color and variety to one`s front yard. Use them to your advantage. 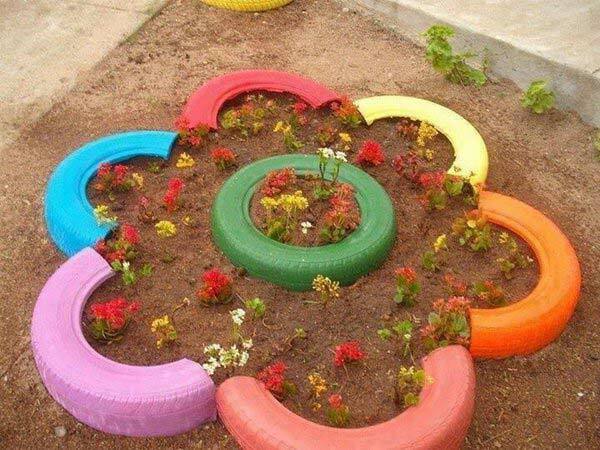 Scaled or not painted tires can become extraordinary raised planters with little to no effort. 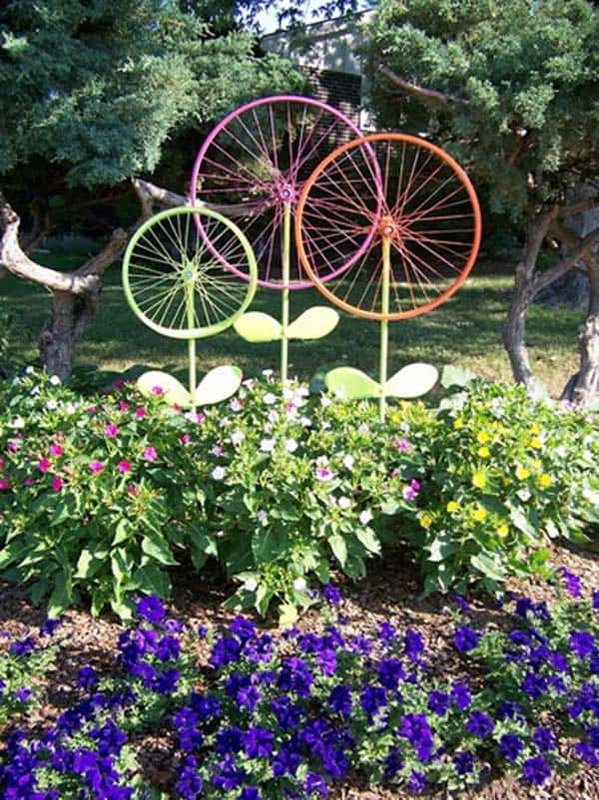 Bicycle rims can be re-purposed with ease with little paint. 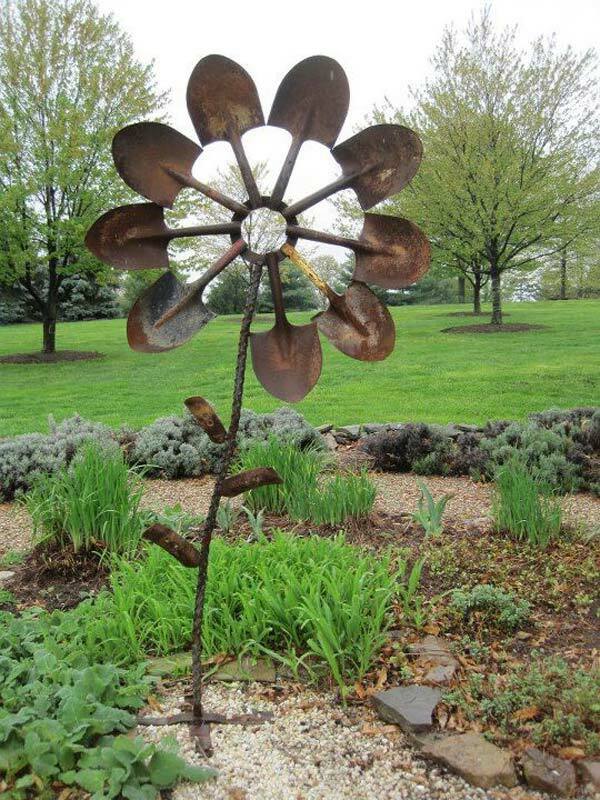 Flowers can change a setting regardless of materiality. 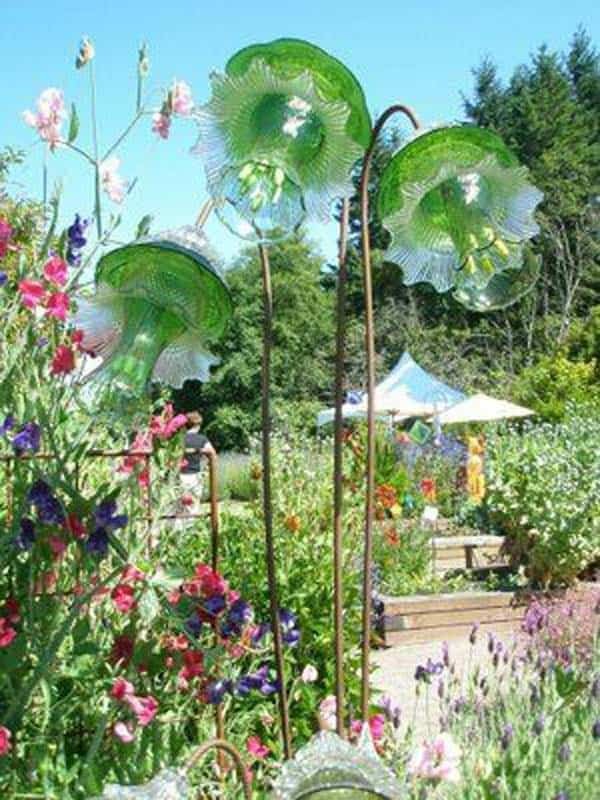 Thousands of glass bottle crafts have inspired the diy community for a good reason, the craft above highlights the immense possibilities. 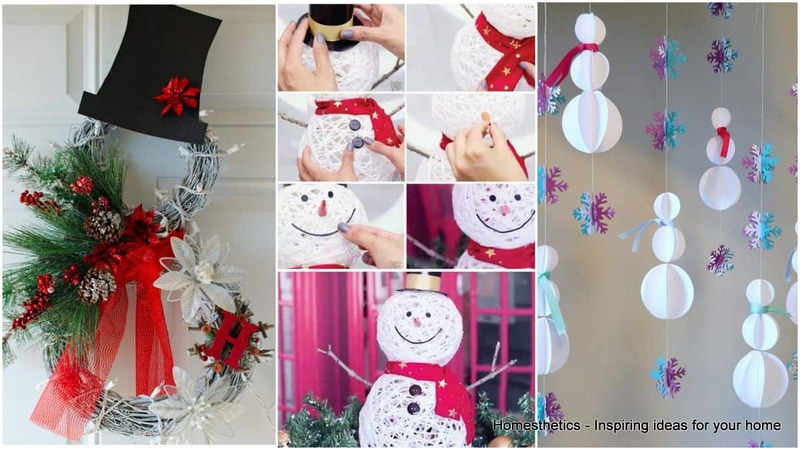 Intricate details can be obtained by scaling the right elements. 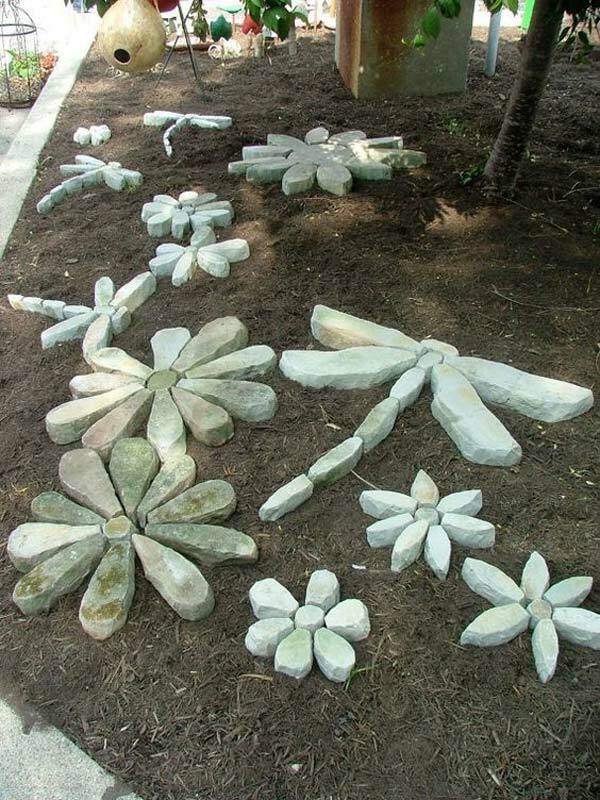 A temporary solution that can capture joy from pedestrians till greenery surfaces. Every now and then a wheel protection falls off and every now and then three others happen to hit the landfill as a result. 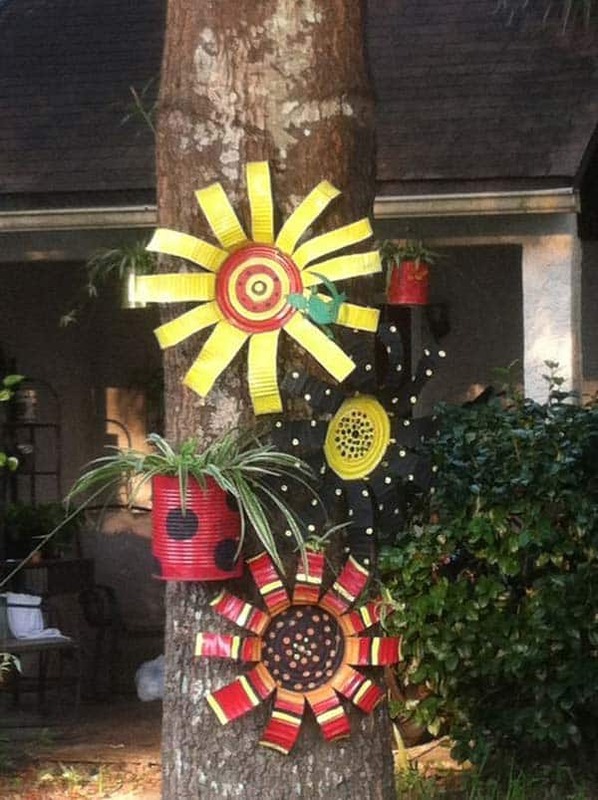 Bring your contribution and attempt to recycle or up-cycle them. A horseshoe can bring luck and joy at the same time. 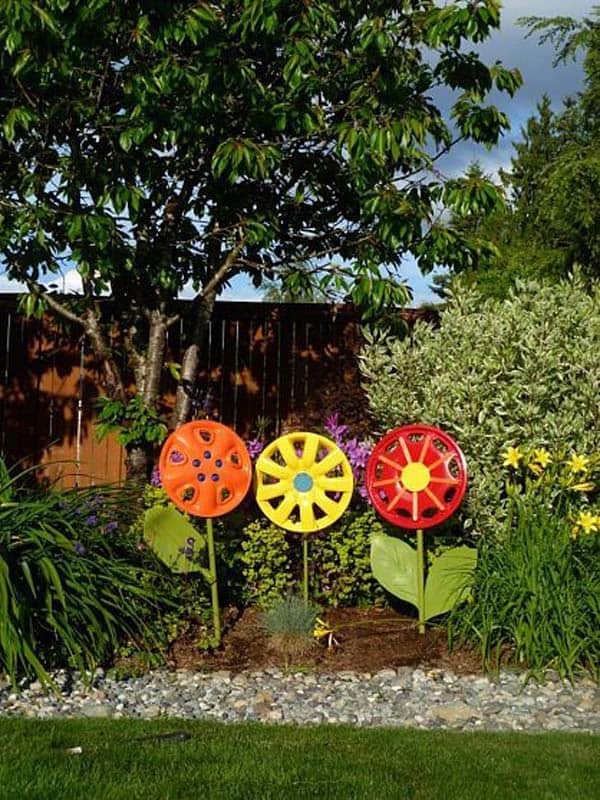 Colorful and joyful plastic wind mills. Scaling the right element creates both rhythm and depth, use the simple practice to your advantage. 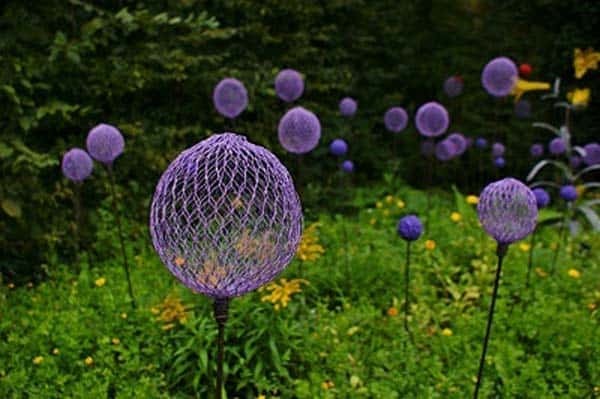 Chicken wire carefully tailored to assemble a bulb that receives color can stun the pedestrian and upon scaling the installation simply becomes extraordinary. 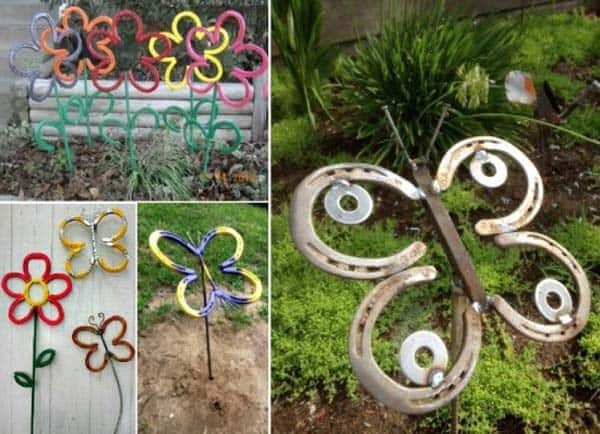 The low budget diy garden art flower projects below might be considered unusual but they`re definitely graphic. What do you think? We would love to hear from you in the comment section below !